Shockwave therapy is a relatively new technology used in podiatry to treat chronic pain. 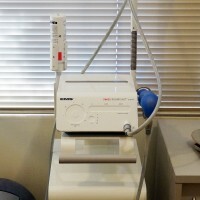 Shockwave treatment can be up to 80% effective in reducing chronic pain and related symptoms. It has been well utilised in sports medicine for over 10 years, and has been the centre of many clinical studies. Conditions regularly treated with shockwave therapy include heel pain, plantar fasciitis, heel spurs and achilles tendonitis. As well as Shockwave therapy, we also utilise therapeutic ultrasound and Laser treatment for acute and sub-acute injury management. Contact Sole Podiatry on 9939 1012 for more information or to make an appointment now!